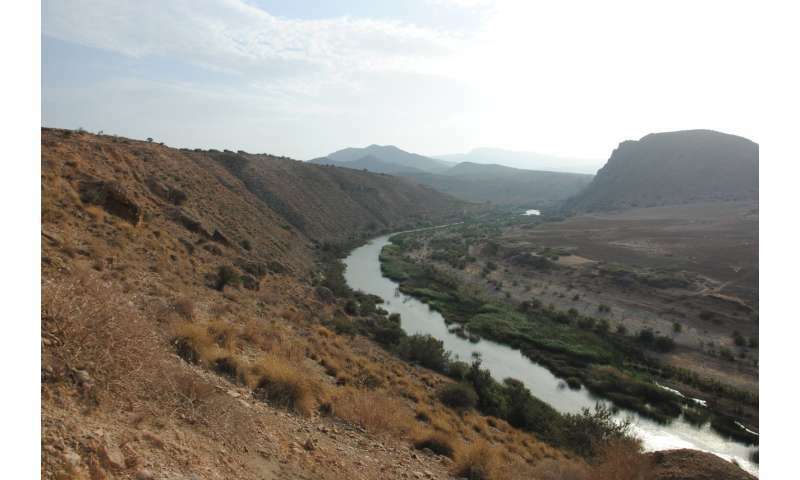 Griffith University has participated in the first international dating study of the fluvial terraces of the Lower Moulouya river in northeast Morocco. An unprecedented combination of dating methods has helped to construct a chronological framework to decipher environmental changes over the past 1.5 million years at a local and regional level. Senior Research Fellow Dr Mathieu Duval, from Griffith University's Australian Research Centre for Human Evolution (ARCHE), was part of an international dating study led by Dr Melanie Bartz from the University of Cologne (Germany) and Dr Gilles Rixhon from the University of Strasbourg (France) that investigated river deposits of the Lower Moulouya in northeast Morocco. The results have been recently published in the journal Quaternary Science Reviews. The Lower Moulouya river is the largest drainage network in Morocco. It is located in the tectonically active convergence zone between Africa and Europe. Until now, the previous geomorphological studies of the area were mostly limited by the absence of numerical dating results. The successful combination of independent dating methods such as Electron Spin Resonance, Luminescence and palaeomagnetism has helped to fill this previous gap in knowledge. "This is one of the first large-scale attempts in which we can directly compare different dating approaches on the exact same stratigraphic section," Dr Duval said. "The different dating methods have yielded very consistent results, giving us confidence in their robustness." Although additional dating analyses have to be carried out in the area to confirm these initial promising results, the study nevertheless strongly suggests the absence of fluvial deposits younger than 1 million years in the area. These results provide new insight into the evolution of the Moulouya River, which does not appear to be mainly climatically driven, unlike many European rivers. Instead the results highlight the key role of tectonic activity in the landscape evolution of northeast Morocco and suggest and an acyclic and discontinuous sedimentation pattern since 1.5 million years ago, which seemingly rules out climate as a main driver in fluvial deposition. At a regional scale, several indicators point to transient fluvial response resulting from major tectonic activity in this area, especially rock uplift in the Beni Snassen massif. The latter strongly influenced drainage organisation, and therefore landscape evolution, in northeast Morocco. The most striking feature of this drainage changes is the formation of a spectacular 30km-long gorge, which deeply cut the carbonate formations of the Beni Snassen massif, as a probable result of river piracy event(s), which made the Moulouya flow in its current direction towards the Mediterranean Sea. More information: Bartz M., Rixhon G., Duval M., King G.E., Álvarez-Posada C., Parés J.M., Brückner, H. (2018). Successful combination of electron spin resonance, luminescence and palaeomagnetic dating methods allows reconstructing the Quaternary evolution of the lower Moulouya River (NE Morocco). Quaternary Science Reviews 185, pp. 153-171.